Remote controlled drones aren’t just for kids anymore. The percentage of adult enthusiasts is increasing, joining friends and clubs in this fun hobby. Many people also utilize flying drones to market their businesses, capturing fantastic video footage that can either be directly sold to consumers or placed on social media sites. 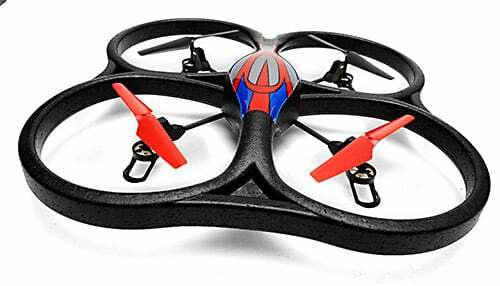 Best quadcopter under 100, making your entry into the hobby affordable and fun. If you think you’ll be clumsy at flight, and are worried about your quad being bumped and bounced around, buying one for under $100 will ease your mind in the event it gets a few scratches and scrapes. As you learn how to fly, you’ll want to level up to the next great quadcopter. You can begin collecting different models, with different functions. Your choices are nearly endless. Chances are you’ll still find last year’s model for sale, or even the year before, and be able to pick up a drone for a great deal. 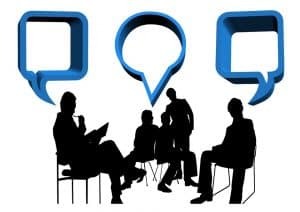 Your best bet is to read reviews online, and read through our quick guide on the best that Syma, Cheerson, Hubsan, WL Toys, and UDI have to offer the adult flying enthusiast. The following quadcopters are easy to fly, and you’ll be pleased with how quickly you can master the art of drone flight. Some even have cameras, to increase your fun on the field. When you’re deciding on which quad to buy, you’ll have the choice of whether to buy a full-size quadcopter or one that is compact. &blacksquare; Durable one piece main frame. &blacksquare; High capacity LiPO battery. The Syma X5C quadcopter has flight functions that can help you to keep it in the air, even when you’re still learning about aeronautics. The Syma X5C quadcopter is made with a white plastic casing and white blades. It comes with a radio controller, with a handy carry handle on the top. There are some great features that come with the Syma X5C quadcopter. The 360-degree eversion allows the quad to stay steady in the air. Besides the usual flying moves such as left or right turns, and backwards, forwards, and sidewards, you have the option of two different speed choices. The lower speed is for the beginner. Once you’ve become a pro, you can try the faster speed. The Syma X5C quadcopter is a starter model, so you don’t have the fancy button to press to do tricks unless you try them manually. This quad weighs in at two pounds. It takes take four double AA rechargeable or regular batteries. It does come with a camera, so you can take photos and video footage. The camera records images at two million pixels. In the box, you’ll also get a screwdriver to tighten the rotors and an SD card. You can purchase optional equipment such as a USB cable. It takes about one hundred minutes to charge up your Syma X5C quadcopter. You’ll have five to eight minutes of flying time. Your Syma quad will fly out to a distance of fifty meters. The Cheerson CX-10 mini quadcopter is more of a compact toy that fits in your hand than a standard quad. It’s priced at under $100 so would make a perfect gift for the kids. It has LED lights and a white plastic casing with an orange bottom. It measures in at only 4.2 by 4.2 by 2 centimetres, so your kids will have fun creating scenarios around this quad. This quad does not have a camera, due to its smaller size. Despite its small size, it still has a built-in six axis system, that makes minute gyroscopic adjustments to keep it stable in the air. There are two different flight speeds, slow and fast. In some cases, it’s actually more difficult to fly a smaller quadcopter, but it’s still quite durable. If it gets tossed around a bit on the field, you won’t have to worry about damaging it. Damage may be inevitable, as it’s so small, you may lose sight of it in the air. If you wish for additional protection, you can buy blade guards. And you can also replace the blades if you need to. You can choose from a variety of different coloured propellers that are available in every colour of the rainbow. The blades actually just pop off, making them easy to change without a screwdriver. One recharge will allow you to fly your quad toy for four to eight minutes in the air. The Cheerson CX-10 mini quadcopter contains a rechargeable lithium battery. Inside the box, you’ll receive one Cheerson CX-10 mini quadcopter, a USB cable, a transmitter, two extra rotors, and a user manual. 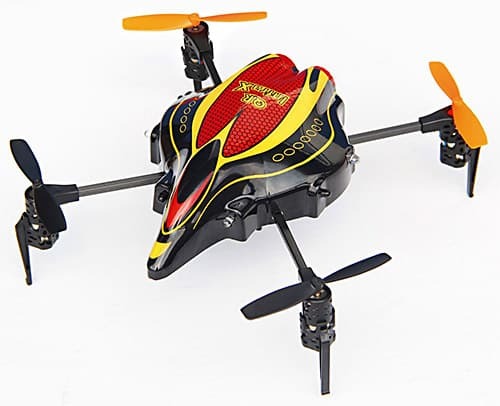 The Hubsan X4 H107L quadcopter is another flying drone that is built with a compact size. This is a drone that has a black plastic casing with white markings, and it fits into the palm of your hand. There are also other colour choices, such as black with green, or green with black blades, or black with red, in case you want to be able to see your drone at a distance. You can also switch out the blades for different colours. The black version does not come with a camera. The other plastic casings may come with a camera, but they’ll be more than $100. 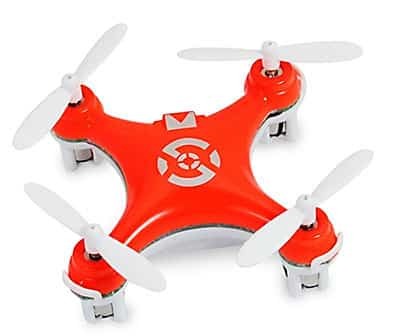 The Hubsan X4 H107L quadcopter has a durable plastic frame, so if your kids borrow it, you won’t have to worry that it stops working if they’re too rough with it. Another great feature of this model is that there are no bolts or screws that will come loose, like with more expensive brands. It only needs a minimum of maintenance. One great feature of this model is that there is a stunt mode button, so your quad will do rolls and tricks in the air. This is not normally a feature that comes in this price range. LED lights will enable you to see it at a distance, and rubber feet will allow for a safe landing. Additional accessories are available, but it does come with a USB cable for charging. It takes about 160 minutes to charge up your Hubsan X4 H107L quadcopter for the playing field. Each charge will give it about seven to eight minutes of flying time. You’ll need to buy two AA batteries. You can fly your drone out to a distance of one hundred meters. It’s safe for kids to fly the Hubsan X4 H107L quadcopter, but you may wish to supervise under age 12. 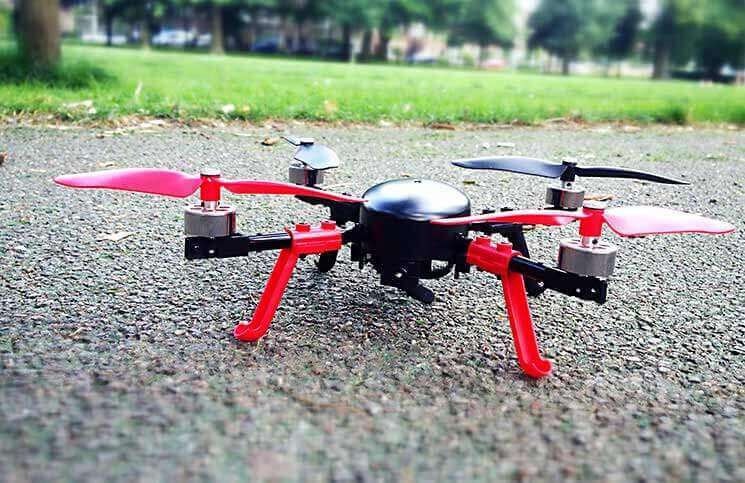 It’s worth taking a look at the WL Toys V636 quadcopter. It has a slightly different look than other quads. It has a silver metallic body with green and black markings. The body is smaller, with larger blades. It comes with a radio controller that has an LCD screen so you can manage the controls. You’ll be able to fly this lightweight drone indoors, with the optional propeller guards. There is no camera with this model. LED running lights will help you to see your drone at a distance. This product is currently unavailable on Amazon. But a similar drone from WL Toys called WL Toys Q282 will do exactly the same job. 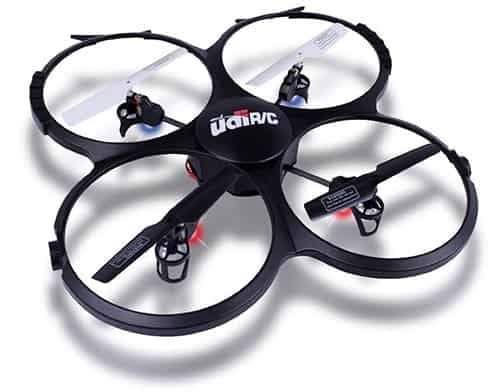 The UDI U818A quadcopter is a lightweight model that comes with a camera. It’s safe to fly indoors and has a black casing with four large circular protective blade protectors. Its maintenance is simple, and parts are easy to replace. The built-in blade guards keep the rotors from becoming damaged, and also protect your walls and furniture, should you wish to fly it inside. The included camera takes both still images and video footage. The UDI has a six-axis gyro with posture control to help keep it steady in the air. The radio controller has a four channel function, allowing for easier user control. It takes two hours to charge up the UDI for flight. You can fly it for seven to nine minutes. It’s also possible to do 360-degree flips. You can fly it out to a maximum distance of thirty meters. This drone is easy to fly, particularly for the beginner. Cheerson has the most inexpensive quadcopter, while the Syma and UDI have cameras for under $100. WL Toys has a long flight range of 100 meters, while the Hubsan has the longest flying time. Decide which features are important to you before buying. Check out the comparative parameters with this handy table so that you can find the best quadcopter with camera under $100, or best drones under $100 if a camera is not that important to you. You can purchase one as a basic model, or buy one with all the bells and whistles you could possibly want. It’s even possible to customize your drone too, though you’ll probably want to leave that for later when you’re a flying expert. The more you practice flying a quadcopter, the better you’ll get at it. Some of the higher priced models are simpler to fly, and that means the learning curve may be steeper for a drone priced above $100. 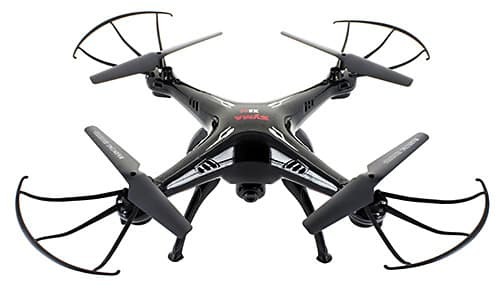 Fortunately, there are still some great drones to be purchased under the $100 mark. When you’re searching for the best quadcopter under $100, you’re going to find yourself overwhelmed with choices. Syma, WL Toys, Walkera, and Hubsan all make their own lower-priced versions of flying drones. When you’re just starting out in the hobby you may be hesitant to spend hundreds on a new quadcopter. That’s why one of these five flying drones may be the best purchase for you. You can try them out with minimum investment to see if they’re right for you. Three of them even fall into the best quadcopters with the camera under $100 category, in case you want to try one with a camera. These all come with video cameras that may work as a still camera, or images can be captured from the video afterwards. Have a look at these five best quadcopters under $100, to find the perfect model for you. They also make great gifts so read each description carefully to find out which might be perfect for your kids, or for an adult friend. 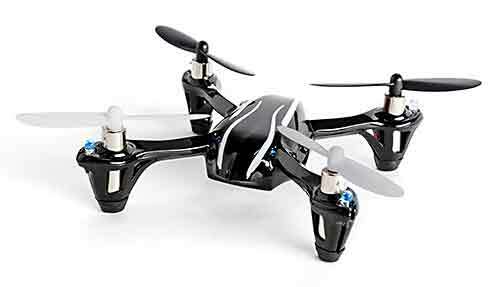 The Syma X5SC is a flying quadcopter with a black plastic finish. There are four blade guards extending from the propellers so that they’ll protect both the drone and your home. They’re easily removable in case you wish to fly it outdoors. This is one of the best quadcopters with camera under $100 drones, priced at $62. The plastic protective circle is made from an elastic material, so your drone will simply bounce back from any rough, hard surfaces. It’ll prevent the blades from bending during flight. The landing gear has a protective tape to keep it from breaking during landings. This will also protect your walls and furniture should you decide to fly it indoors. If you choose to do so, try it in a larger room, or the recreation room. The Syma X5SC has fun flashing lights so you can play with it outdoors. Friends, family, and pets will have fun as you pilot it through the air. You can even run it at night, with care. The lights will make it easier to follow in the dark. The six-axis gyro technology will enable even the beginner to quickly learn how to fly the Syma X5SC. It has a headless and intelligent orientation flight control system (IOC). With a headless IOC, the beginner can learn quickly, with a shorter learning curve, as they don’t have to rely on nose direction. A pilot can learn each step of flying, and enjoy flying while doing so. You can turn the headless mode on or off via the controller. Once you feel confident about flying you won’t even need to use it anymore. The Syma X5SC comes with a built-in camera. It has 2 MP HD capability. You can take either video or still photos as your drone is in flight. Download them to your camera later, and share with friends. It provides a fun memory of your outing. The camera uses an SD card so you can remove it and add a new one if you wish to shoot more video. Otherwise, leave it in and when you get home to use the included USB cable to load to your computer. However, you will need to purchase your own SD cards as they aren’t included in the box with the Syma X5SC. With the Syma X5SC, you can do 360-degree rolls and continuous turns. The Syma X5SC is a full-size drone and weighs about 1.6 pounds, and measures 12.2 inches by 3.2 inches by 12.2 inches. The flight range will reach out to about 30 meters, which should be plenty to keep you entertained. The battery will allow you to have more scheduled drone flight time. A 3D lock will keep it from turning on during transport. The Syma X5SC is priced at approx $62, is one of the best drones under $100. Syma is a great brand, worth taking a closer look at. If you’re a novice, you should quickly get the hang of flying with the Syma X5SC. 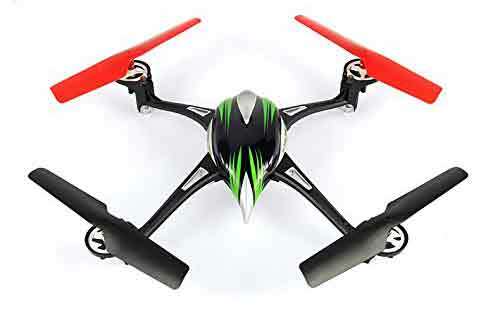 WL Toys V262 Cyclone is a great quadcopter in a black finish, with a blue, green, and silver body. There are two black propellers and two red propellers. This colourful flying drone has four circular protective plastic coverings to keep the blades secure. This type of quadcopter is more durable and easily repairable should it become damaged during flight. The cover is built with durable materials so that it provides more protection for the propellers, and for your walls and furniture if you choose to fly this inside. It’s built of lightweight material, making it easier to fly, and promising to be a gentle flight while indoors. The rotors on the WL Toys V262 are gear-driven, which will relieve some of the pressure on the motors. The WL Toys V262 2.4 GHz transmission ensures that you’ll have an interference-free operation which is important if you’re in a field of others who are also flying the same brand of drone. It takes about one, to one and a half hours to fully charge up the battery for flight. Once charged, you can fly your drone for eight to ten minutes. You’ll be able to fly your drone out to a distance of 100 to 150 meters. It’s quite agile, and you’ll be pleased with how well it responds to your commands. You may want to charge it up immediately after returning home as it does take a while to charge. Better yet, buy some extra battery packs so you can extend the flying fun outdoors. 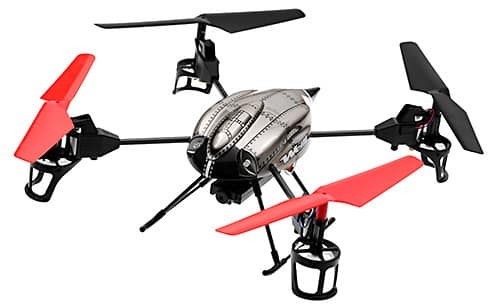 The high capacity battery will allow you to fly your WL Toys V262 for a longer flying time. The battery is rechargeable on the drone. The controller unit takes six AA batteries, which are not included in the box. You can push a button on your controller and it will enter the trick mode. You’ll be able to do flips and rolls, to impress your friends. The WL Toys V262 has a fully proportional remote control so it fits comfortably in your hands. All skill levels will enjoy flying the WL Toys V262. In fact, many people will never know how little you paid for it. It’s a great deal. It has a six-axis gyro system which is standard for this type of drone. In the box, you’ll get one quadcopter, the remote transmitter, a battery for the drone, one charger, and four spare propellers. This drone does not qualify for the best quadcopter with camera under $100, as it does not have one, but it can certainly compete in the best drones under $100 category. It has some great features that are often only present in models that are priced over $100, so you know you’re getting a great deal with this unit. The WL Toys V959 is an affordable quadcopter at around $55. Since it includes both camera and drone, it’s a great deal. It’s playfully nicknamed the Future Battleship Spy Drone because it comes with its very own “spy camera”. This drone has a light grey finish with nice detailing on the body, to make it appear to be a battleship drone. It has two black propellers and two red propellers. It features a simplistic quadcopter design and is aimed at the novice, interested in seeing what the flying drone fuss is all about. The WL Toys V959 is built with a lightweight design. It’s protected by durable elastic products so that it stays protected during bumps or when landing on the ground. Its four motors are protected by plastic casings, making it perfect for a learning tool, or for flying indoors. The WL Toys V959 will work for pilots of all different skills levels. The control sensitivity will provide quick route changes in a millisecond. The transmitter has a special trick button, and when you press it you can enter trick mode. The trick mode will enable you to do some cool moves with your WL Toys V959 drone. It will perform rolls, flips, and more. The WL Toys V959 has built-in LED lights so you can run your drone at night. It’ll also enable you to get the correct nose first orientation for more accurate flight. Many hobbyists only fly their drones during the day, but flying at night can also be fun. Be sure to do it on a large field so you can keep your lights in view at all times. You don’t want your drone taking off into the sunset, and there’s no “return to home” feature at this price point. The camera is mounted at the bottom of the unit. It has an adjustable lens angle which allows it to be more adaptable in collecting some cool shots. You do have to adjust it pre-flight however, as it cannot be automatically adjusted during actual flight. The WL Toys V959 is one of the best quadcopters with camera under $100. It measures at 23.5 cm and if you’re looking for your first quadcopter, the WL Toys V959 is one of the best drones under $100. The Walkera QR InfraX is one of the drones at the top end of $100. It features an attractive black body with the red and yellow design. Its appearance makes it appear to be a more expensive model than the other drones on the list. Two blades are black, and two are orange. It comes with a full-size transmitter. It has an advanced six axial flight stabilizing system, guaranteeing stable flight. If you don’t mind the higher price, the Walker QR InfraX can be considered the best quadcopter with camera under $100. One of the really neat features is that it almost becomes self-steering with its infrared obstacle avoidance system. This will help the aircraft to minimize crashing. The ultrasonic altitude hold system will also allow the aircraft to maintain a stable flight. Both of these functions are great for when you may not be a pro yet. 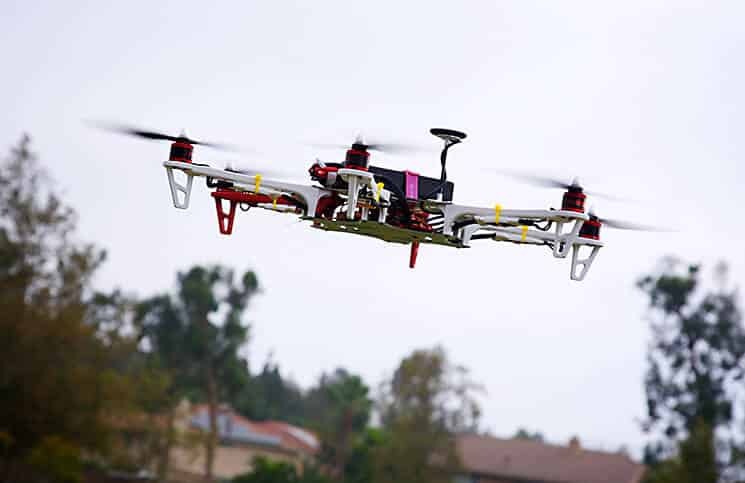 It has eight built-in sensors around the quadcopter, helping you to fly better. You’ll soon be able to achieve a smooth and clean flight path with the Walkera QR InfraX. Just keep on practising. The Walkera QR InfraX weighs 2.4 ounces and measures 17.7 x 11.8 x 4.4 inches. It’s not recommended for children younger than 14. You can always unscrew the sensor board if you wish to make this drone ultralight. You won’t even need it after you master drone flight, and they’re a bit gimmicky anyway. The Walkera QR InfraX is one of the best drones under $100. Its unique infrared sensors will enable you to fly your drone perfectly. The Hubsan X4 H107C is the red and black version of the X4 that comes with a camera. It retails for around $50. Its lightweight frame will enable you to pilot it with super stable flight. The controller has four channels, to avoid interference with other drones on the field. The video camera films 0.3 MP. You’ll need to add your own SD card. The camera points straight ahead, it is not adjustable. You can fly the drone left, right, backwards, and forwards. It’s one of the best quadcopters with a camera under $100 drones on the market today. 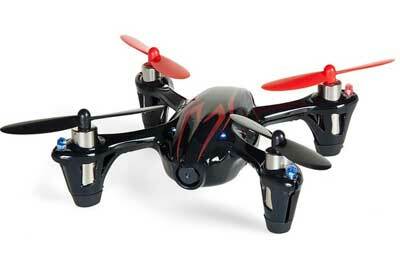 The Hubsan X4 H107C is a mini-drone and measures in a 2.7 x 2.7 x 1 inch. It weighs only 1.1 pounds. It’s powered by a lithium-ion battery. It’s recommended for ages 14-15 and up. The Hubsan is built with the latest six-axis flight control system, with self-adjustable gyro sensitivity. This makes it as easy to fly for the novice, as for the expert. You can charge up your Hubsan through your computer. This is handy as you can download video and take care of the charge at the same time. The Hubsan comes fully assembled, so you don’t need to do any construction. Simply remove from the box and go. Syma, WL Toys, Walkera, and Hubsan all make great flying drones. Each brand has their own line of flying drones that vary in cost from under $100 to $200 and up, depending on features. Start at a lower price to see how these flying drones may work out for you. If you discover that you enjoy flying them you can work your way up to a more expensive model. These five quadcopters are some of the best drones under $100. The Syma, WL Toys V959 and the Hubsan X4 H107C all come with cameras, making them fit into the best quadcopter with a camera under $100 category. The drones that do have cameras have good resolution, but not cinema quality, but they’re great for fun. The Hubsan takes the least amount of time on a battery charge at 30 minutes, while being the most affordable at $50. It’s difficult to find the best drones under $100 that have a longer flying time than ten minutes. Both WL Toys and the Hubsan promise up to that ten minutes. Both WL Toys models promise a longer flying range of 100 to 150 meters. Take a look at the comparison chart to see the features of each flying drone. Use it to help you narrow down your search for the best flying drone for you.